The Athens newspaper Documento published an article on the conference by Anna Papadimitriou, which includes interviews with several conference plenary speakers including Dave Hill, Marnie Holborow, Grant Banfield and myself. There is a disconnect between the rhetoric and reality of democracy in that subverts traditional approaches to democratic education. The tropes that have historically dominated the discourse on democracy and democratic education now amount to selling students (and ourselves) a lie about history and contemporary life. Our challenge is to re-imagine our roles as educators and find ways to create opportunities for students to create meaningful understandings of the world. Education is not about showing life to people, but bringing them to life. The aim is not getting students to listen to convincing lectures by experts, but getting them to speak for themselves in order to achieve, or at least strive for an equal degree of participation and a more democratic, equitable, and just future. This requires a new mindset, something I call dangerous citizenship. 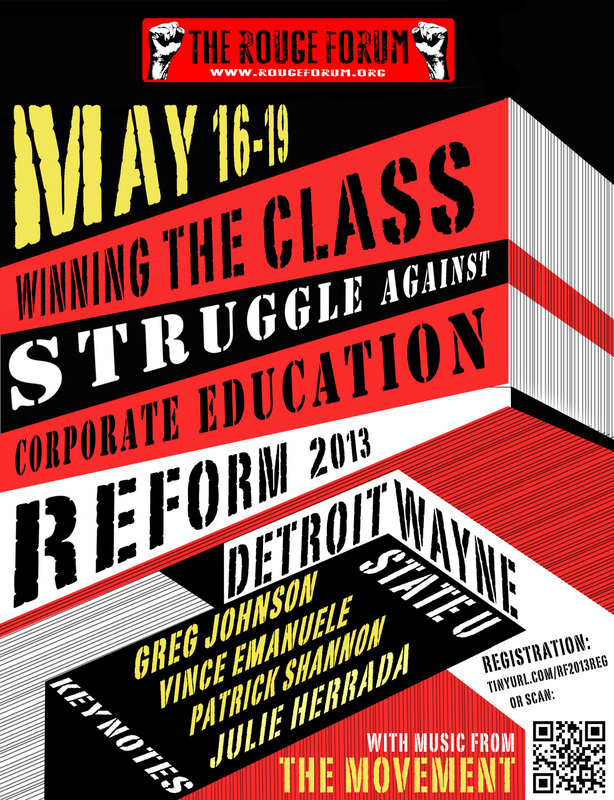 The theme for the 2014 Left Forum Conference is “Reform and/or Revolution: Imagining a World with Transformative Justice” (read or download it). The call for panels can be downloaded here. This is the 10th year of the Left Forum, which will be held from May 30th – June 1, at the spacious new conference center at John Jay (CUNY) College in New York City. The conference grounds include beautiful open social spaces and many conference rooms (preview here). The main aim of the conference is to facilitate scientific dialogue around the theme of social justice and diversity in connection to teacher education in a wide sense through questions and answers offered by solid research studies. Traditional conferences often give very limited place for real dialogue and sharing around findings and problems. However, research is always a social activity too, and it needs to be discussed, shared and reflected in research communities. Scientific activities might also better contribute to the transformation and development of societies and communities if knowledge coming from research is constructed and reflected together by gathering findings, questions and possible answers. In order to promote dialogue, discussion and common knowledge construction, the sections of the conference will be organized in accordance with this principle, and the whole conference will be characterized by this atmosphere of sharing. The conference welcomes any kind of theoretical, empirical or methodological research papers related to the conference theme from different disciplines, approaches and research traditions. Participatory, collaborative or practitioner research studies are particularly welcome as well as policy analysis. If you would like to participate in the conference without presentation, please also use the registration form. In order to foster real dialogue in the sessions, participants have to send their full paper (between 5000 and 8000 words) or at least a shorter, draft version of their paper (2500 – 3000 words) and their presentation (if they wish to use slides) one month before the conference. The papers and presentations will be uploaded to the conference website (to a platform accessible for participants). It is very important that the participants choose and read the papers in advance, and in this way after the shorter presentations, there can be a real dialogue about the research studies in the sessions. The number of presentations is limited to 110, and each author can submit only one abstract as single (or main) author, and another one as co-author. All abstracts should be submitted in English, which is the official language of the conference. All abstracts should be submitted on the registration form on this website. High quality research can be presented in some words. Abstracts should be very concise, no longer than 100 words (title not included). They should indicate briefly the (theoretical and/or epistemological) approaches and applied methodology and the summarized main findings; or they should present the theoretical or methodological problems of the paper, and the offered answers, views or statements. appropriate style and language in accordance with the topic of the paper and with the concise nature of the abstract. Full papers, after a process of double blind review, will be published online on the Conference Proceedings. High quality papers could be sent for submission to the European Journal of Teacher Education. !! FREE AND OPEN TO THE PUBLIC !! The desirability of a SUNY-directed model of Peace Studies that would promote alternatives to violence through the creation of a minor by 2016 and a major by 2020. Jack Gilroy is a high school teacher at Maine-Endwell and has been a peace activist since the Vietnam War. He was the director of the Committee of Responsibility in Upstate New York working to bring back war injured children from Vietnam. Educational pedagogies and projects that promote the implementation of peace that can be implemented in anti-bullying and other existing programs directed at youth. Tim Wolcott teaches Life and Physical Science and supervises the greenhouse projects at Waverly Middle / HighSchool. As Adjunct Professor at the University of Albany he also directed Waverly’s Science Research Program. An interrogation of debates surrounding the campus presence of guns to police student populations and securitize the university environment to the detriment of peace. Ben Brucato is a doctoral candidate in Science and Technology Studies at Rensselaer Polytechnic Institute. He has published research on surveillance and policing at colleges and universities. This is a two person presentation on a recently released book “The End of Prisons,” which provides an in-depth look at what prisons try to accomplish and how we can dismantle them through an abolitionist strategy of decarceration in the relation to the American legal system, national security, and human rights. Mechthild Nagel is Professor of Philosophy at SUNY Cortland and is the Director of the Center for Gender and Intercultural Studies. Ute Ritz-Deutch received her PhD in History From Binghamton in 2008 and currently teaches out of the History Department at SUNY Cortland. After a decade of being under heavy federal surveillance for exercising free speech in support of the Earth Liberation Front, Leslie James Pickering discovered his associates are being questioned by the FBI, the Post Office copying his mail, and was individually put on a secret list for maximum security screening at airports. This multimedia presentation will show the methods of federal government uses to repress activists and ways in which they can be resisted. Leslie James Pickering is an activist, author, and co-owner of Burning Books in Buffalo, NY. He was a spokesperson for the Earth Liberation Front Press Office from the late 1990s to the early 200s. Argues that resistance must come from one’s epistemic privilege and that the black body offers a unique positionality to confront sites of violence through their constant engagement with anti-blackness. Raul Cepin is an undergraduate at Binghamton University and is a Varsity member of the University’s debate team. As drone warfare has increased the Upstate Coalition to Ground the Drones and End the Wars has begun campaigning to say no to targeted assassinations. Their actions of civil disobedience has resulted in numerous jailings and detentions of activists. Jim Clune has been active with the Upstate Coalition to Down the Drones and End the Wars since its inception and has been to El Salvador, Iraq, and Palestine to stand in solidarity with those who have suffered. A focus at the 174th Attack Wing of the NY Air National Guard and recent court rulings that have issued orders of protection meant to suppress collective outcries against the victimization of women, children, and other non-combatants. Ed Kinane formerly worked on Wall Street and taught high school and college. He has worked with Peace Brigades International in Guatemala, El Salvador, Haiti, and Sri Lanka. An account of people on the ground who have been killed by drone strikes and the absence of reports from the United States to provide a justification for their strikes, as drone policy finds itself exempt from national and international laws. Judy Bello was jailed for 3 days for protesting the Hancock Air National Guard Base, co-led a FOR Delegation in Iran, administers the website for Upstate Drone Action Coalition, and blogs at The Deconstructed Globe. This past weekend I had the great honor and pleasure to deliver a keynote address to the 6th Annual Equity and Social Justice Conference held at the State University of New York at New Paltz. I would like to thank the conference organizers for inviting me to participate in an exciting day that included many cutting edge papers as well as a provocative and high energy performance/workshop by the Hip Hop Psychology Performing Arts Movement. My keynote, titled “Dr Seuss and Dangerous Citizenship” explored the efforts of governments (in British Columbia, Arizona, and Texas) to keep schools “political neutral” and how these actions actually undermine opportunities for objective teaching and curriculum. 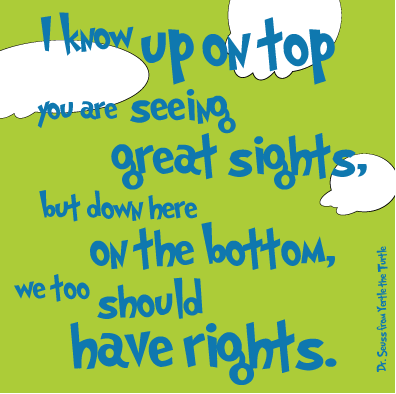 I outline the contexts of rulings that have restricted the rights of teachers to express political views in BC (specifically in Prince Rupert where teachers have been banned from using particular Dr Seuss books and in a bizarre irony have also been prohibited from wearing t-shirts displaying portions of the Canadian Charter of Rights and Freedoms). I also outline the attacks on Tucson (AZ) school district’s Mexican American Studies program and the right wing Christian revisions of the Texas history curriculum, which demote Thomas Jefferson and promote St. Thomas Aquinas; deletes abolitionist Harriet Tubman and highlights the Confederacy; and emphasizes the role of religion in American society at the expense of the US Constitutional separation of church and state. If political expression is repressed and restricted in schools (and it certainly is, as I illustrate in this talk) then there are reduced opportunities to critically examine knowledge claims. The ideology of neutrality that dominates current thought and practice in schools (and teacher education) is sustained by theories of knowledge and conceptions of democracy that constrain rather than widen civic participation and functions to obscure political and ideological consequences of so-called “neutral” schooling, teaching, and curriculum. The consequences include conceptions of the learner as passive; democratic citizenship as a spectator project; and ultimately the maintenance of status quo inequalities in society. I offer up “dangerous citizenship” as a framework I have developed along with Kevin D. Vinson (University of the West Indies) for re-thinking responses to these conditions and explore the work of interventionist artists as sources of inspiration for teaching and curriculum. Download the paper and accompanying powerpoint from Academia.edu or below. Neoliberal and neoconservative educational politics have significantly been damaging education all over the World. Public education is regarded as old fashioned, private schools and a variety of types of education have been presented as an ideal model, schools and the students are now in a more competitive relationship, public education has been losing its status as a social right as a result of relationships with the market, and the state is rapidly losing its social character in the face of these developments. It leads us to rethink education given problems such as the education becoming less democratic, less secular and losing its scientific character; becoming more conservative and capital oriented and becoming less concerned with- in fact- detrimental to- issues of equality and critique. In rethinking education, the critical education movement takes an important role in creating new horizons and strategies against the global attack of the capital. 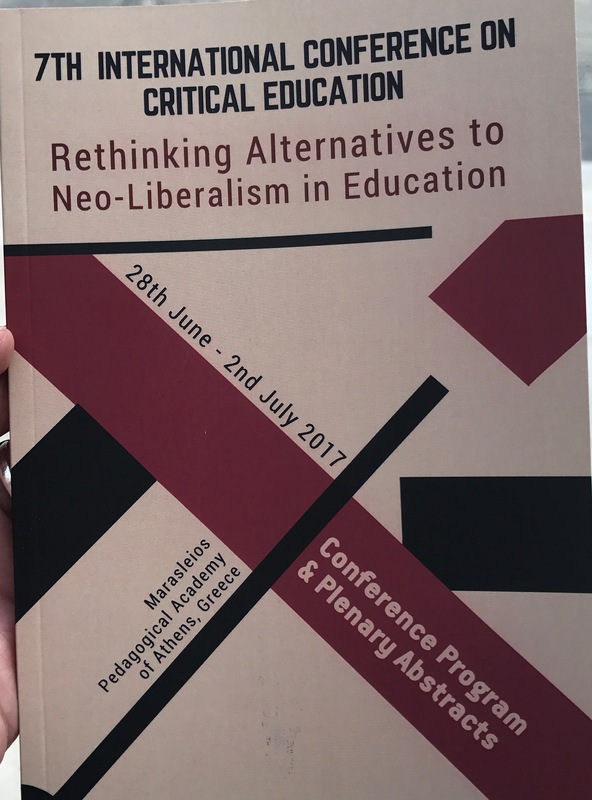 The International Conference on Critical Education, which was held in Athens for first meetings, provides a base for the academics, teachers and intellectuals who are interested in the subject to come together in order to overcome obstacles for public education. Therefore, in the age where education is under siege by neoliberalism and neoconservatism, we invite you to the IIIrd International Conference on Critical Education to reflect on the theory and practice of critical education and to contribute to the field. empowerment, agency, and self-actualization. Education in a democratic society is meant to foster the development of active citizens who think critically and act equitably, and educators are charged to keep that promise alive. • What kinds of data are meaningful in the quest for social justice through education? • How is standardization affecting pre-service and practicing teachers? Students? Administrators? • How might the experiences of students, teachers, and administrators in alternative settings inform traditional classrooms? • How are efforts to achieve social justice and equity affected by the current reforms? • How can educators use data to resist the negative effects of standardization? • What is measured by standardized assessments? How can classroom assessments amplify and/or negate the results of standardized assessments?